So y'all know my issue about organization right? Well if you don't ya must be new around here because sometimes it borders on obsessive. I am constantly thinking and trying new ways of organizing different things in my craftroom *okie wishes the rest of her house had the same issue*. 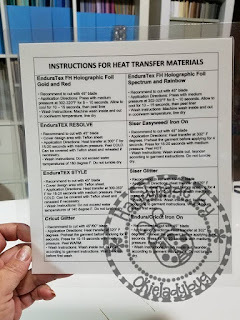 I ordered some more HTV, heat transfer vinyl in case someone doesn't know what that is, and I knew it was time to get it in a better method than just a corner in my craft closet where it was hard to get to and go through. 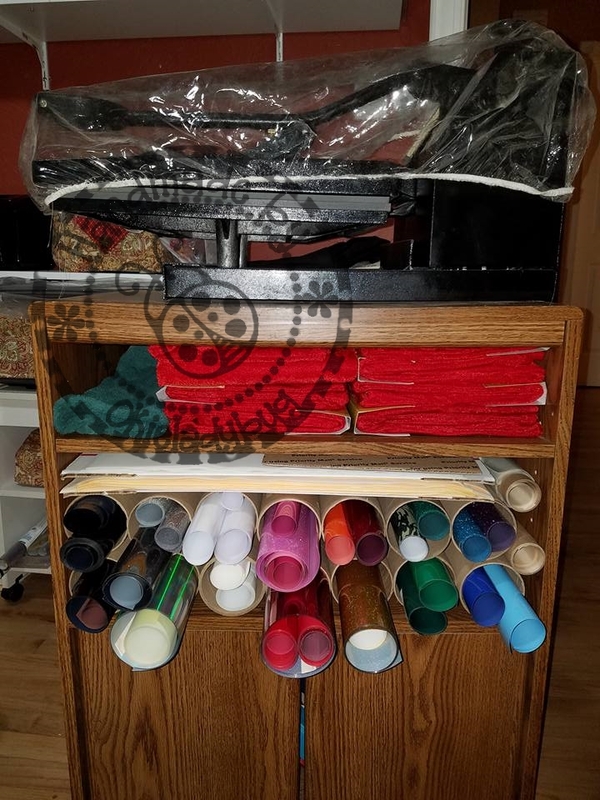 I have my heat press on an old microwave cart, and when I say old I mean I have had this thing so long that I can't even remember when I got it, and have been meaning to see if I could put my HTV on the cart with the heat press since that just seemed to make sense! Luckily I have saved my cardboard tubes over the years *okie has no idea why she would even save the dang thangs* and they came in handy for putting on the cart and separating my HTV. Some of the HTV sticks out, which I don't like but it will do for now since it's so much easier to see what I have and to grab and use. I am planning on finding another place for the books and stuff that are in the area where the doors are so I can keep items or projects that I will be pressing. The little shelf above the HTV has some bags I will be pressing and also a template for tshirt sleeves. I also was able to put my sticky flock and some of my rhinestone template material on the cart. It's the flat sheets sitting on top of the tubes. 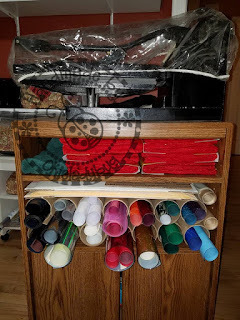 Those items had been rolled up and I will have an easier time using them and not dealing with getting it to lay flat when I am ready to use them. 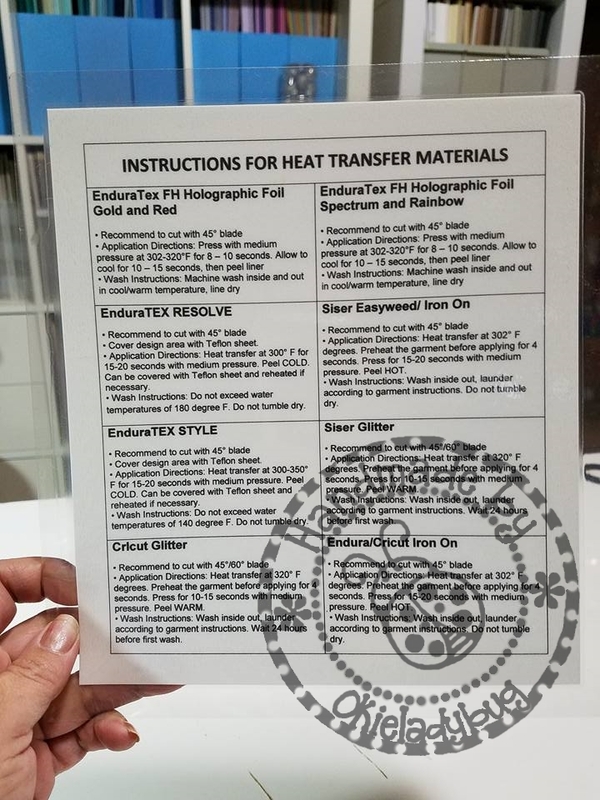 During a moment of "why didn't I think of that sooner" I made up a chart of heat press settings for various HTV I have and after printing I laminated it. I keep it under my heat press and can grab it quickly instead of having to sit down at the computer and look up the settings each time I am ready to heat press something. I do have this, well not this particular one because I took off the EnduraTex holographic HTV items since those particular ones are no longer available, in a PDF file if you would like to download and print your own. I made it a PDF file since some people don't have access to MSWord. So cool! I love to organize, then re-organize, pull out my label maker, and make sure I know where I put things (sometimes I have such genius, that I forget what system I have come up with.